Have you ever noticed how things come in clusters? As if the universe is afraid you won’t notice something if only one message is sent? A few weeks ago a local woman passed away. She had dementia, which most of us didn’t even know. She was in the early stages, but then she quickly worsened and died before many even knew she was ill. It made me sad to think I wasn’t able to visit with her or say our farewells. A few days ago my sister mailed me some old letters I had written. One included a story about my fire department days and a call on Christmas Eve. As I read the letter I realized I’d completely forgotten that story. I told my husband, who’d been on the call with me, although he wasn’t a hubby at the time, and he’d forgotten it, too. It made me wonder how many other stories are long gone. And then today on the way home from errands I heard a radio program about dementia. The first thing the speaker said was, if you were diagnosed with dementia and knew you were going to lose your memories, what would you do? My immediate thought was, I’d write them down. That I’d get out the paper and pen and write down every single memory I could think of. That thought was followed by: why wait? These kind of questions come up whenever you think about mortality. What would you do if you only had a week to live? A month? A year? When I was diagnosed with lymphoma I never once thought it was terminal. But my husband kept asking me what I wanted to do, and I finally realized he needed to have a plan. So I told him I wanted to go to Alaska. Which I do, but the answer was more to help him than because I thought time was limited. Which is probably why I still haven’t gone to Alaska. But even with things like that, the question still stands. Why wait? Beyond the obvious answers of no time off from work, no finances, etc. All legitimate reasons for putting things off. None of those reasons though, are excuses for not writing your memories down. Some day, we’re going to forget. Even if it’s just due to time, as in that firefighter story in the old letters. And some day, someone will be very thankful that you made time while you still could. Strider has passed away and Arthur is now driving. Thanks for the nudge. I have a bunch of things from my parents that I know nothing about. My sister does, however. I need to have her tell me their stories. And I need to tell mine for my children. Funny, though — I keep thinking my life doesn’t have many tales to tell. I’ve never been through a war, saved a life, struggled and become a star, been on a great adventure, discovered a new species of plant or dinosaur, or any other heroic thing. However exciting and valuable those things are, I think there is still value in telling one’s own tale — it gives those who come after a sense of where they came from and that they belong somewhere worth remembering. Strider is huge, what a beautiful animal he was. Love this post. I was thinking about this just yesterday – and then I thought how wonderful it is that we write things like this on our blogs, where they will always be. I hope some day when I am gone someone is still reading these posts, these memories. I know what you mean. I hope so, too. 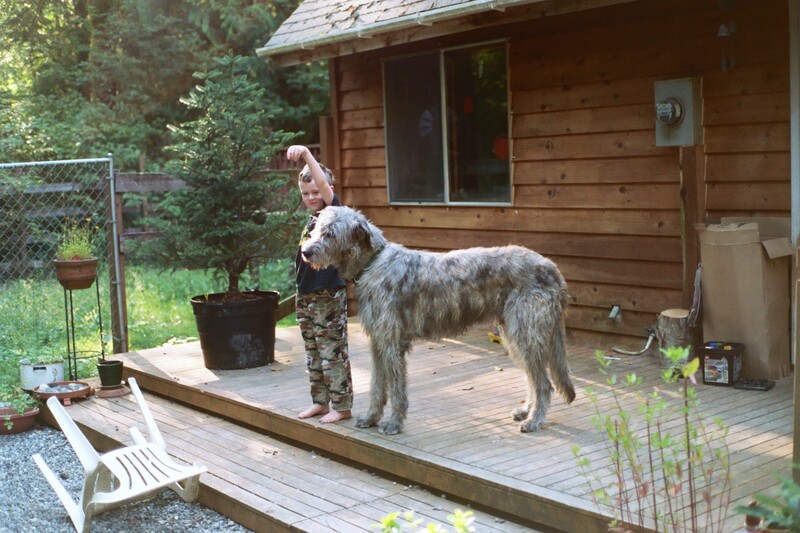 Strider was an Irish Wolfhound, and a gentle giant. Still miss him. He thought he was a lap dog – he’d stand crosswise to my lap and kind of tip over sideways. I could rest my chin on his back when he sat like that across my lap. Pretty funny. A friend (well, actually, an in-law) recently commissioned me to interview his parents about their lives. I felt strange about it at first, as if I were acting as a stand-in for their child, but once I got them talking, I truly enjoyed hearing their stories. 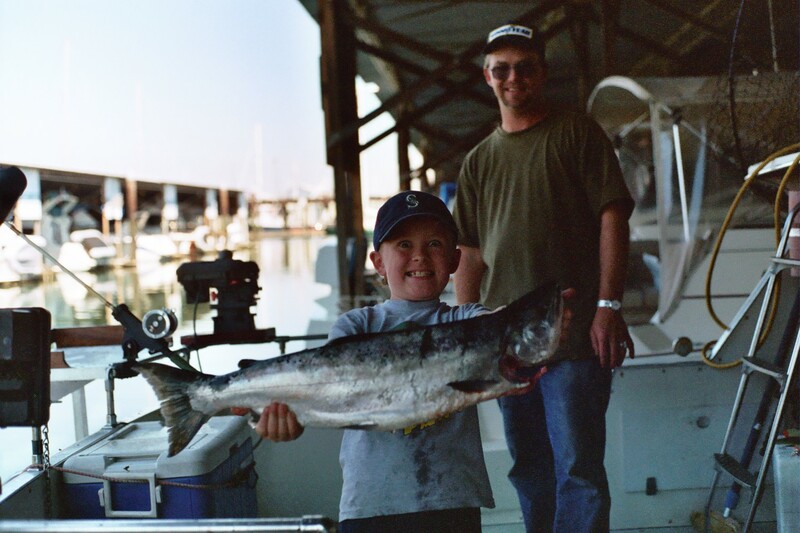 With the dad in particular, it was like opening floodgates — I talked to him for something like four hours and he could have kept going. It’s not just our own/family memories that are worth preserving, but everyone’s, since the world is always changing and so much that was normal back in the day is unthinkable now (and vice versa!). Very true. There was an elderly man in the town I live near who was in his 90s when he died, and he’d been born there. In my job working for the town, if I had any questions about where old pipe might be, or who lived in specific house, he knew everything. His relatives have cassette tapes of all his stories (and he was quite the storyteller) and I keep offering to transcribe the tapes as I’m sure they’re degraded. As you say, all our stories are valuable. My father passed away last year of Alzheimer’s. My uncle (my father’s brother) passed away last week of dementia. The warning signs are there for me and my siblings. The question, “why wait?” lingers in my brain, yet still sometimes I hold back rather than choosing things I want to do. I wonder why. I wonder how much of that is being female. Raised to put others before self, to nurture and take care of everyone except ourselves. As you say, why wait? I would say that has something to do with it. As feminist as I am, I still find myself falling into the societal expectations and making sacrifices. It’s a hard habit to break.